WeDriveU drivers Paul Vallejo and Anthony Norwood at client event. Image (c) WeDriveU, Inc.
One of the perks at WeDriveU is not only getting a sneak peek at luxury vehicles before they hit the market, but our drivers getting behind the wheel to guide VIPs and media during press launches with automakers. With Southern California’s breathtaking coastline and hillsides as the backdrop, this SL63 program was over-the-top. 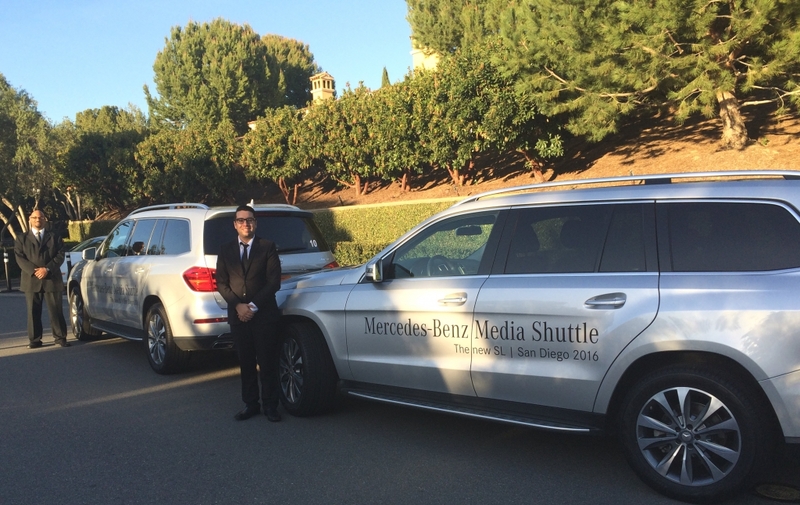 This client needed a transportation management and staffing partner for a complex media program starting at the Resort at Pelican Hill in Newport Beach, then on to the Hotel Del Coronado in San Diego. We spotted several articles highlighting the media’s experience and look forward to seeing how our client will top this! Scalability – Ability to staff on-site managers, professional drivers and brand ambassadors across the U.S. Following this successful event, the team went on to the 2016 NYIAS (New York International Auto Show). Learn more about WeDriveU’s automotive event capabilities and reach out to brainstorm with our team.